Unstoppable hauling power, made to military specs! 20 x 14 x 13.5"
The daily working Backpack worn by soldiers and Marines during combat, patrol, security sweeps and anything else required for the day. Transports an astounding 2,258 cubic inches of gear, keeping each piece organized for easy retrieval. Massive internal hydration reservoir. MOLLE straps on the sides, back and bottom for almost unlimited options for adding more gear pouches. 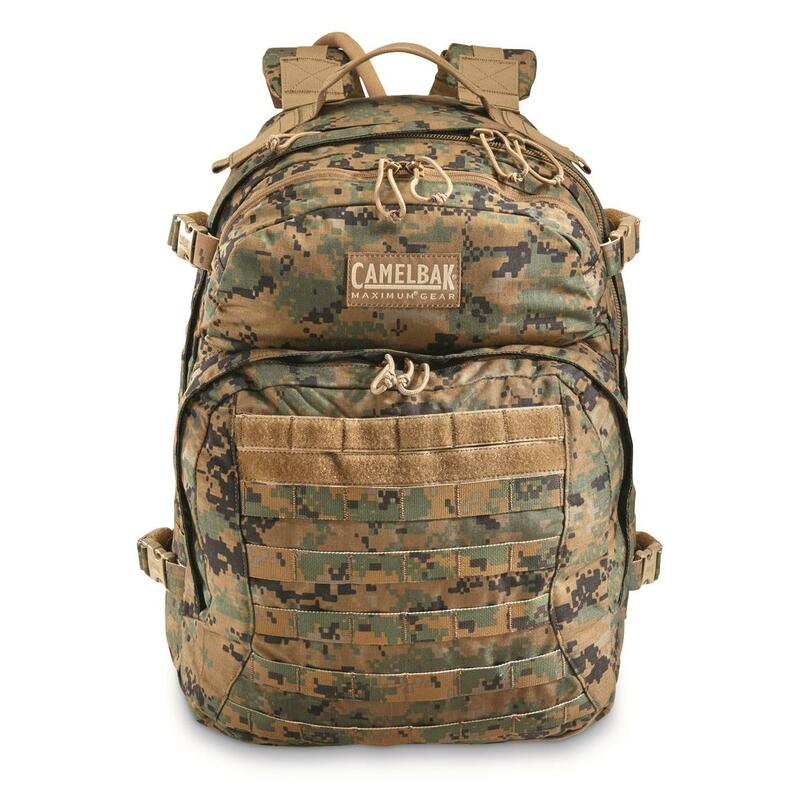 Manufactured to precise U.S. military specifications by CamelBak®, and sporting the famous CamelBak® logo on the back. Superior hydration technology for overcoming any obstacle! Military-spec hydration reservoir is so tough, you can drive a truck over it. 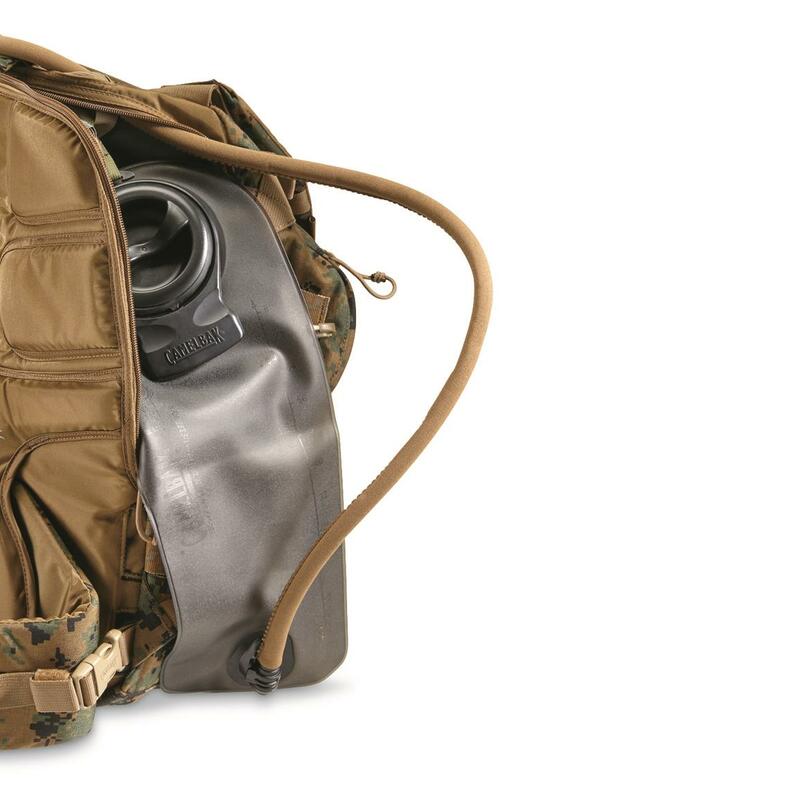 Holding over 3 liters of refreshment, it includes an insulated tube and bite valve to deliver primo relief where and when you need it. Separate zip hydration compartment is accessible from the back, so you don't have to dig through the rest of you gear to get to it. Finally, an extra-wide opening makes refills and cleaning a cinch. You can even get your whole hand into the reservoir for deep scrubbing after the end of a long mission. Don't pass up this incredible find! 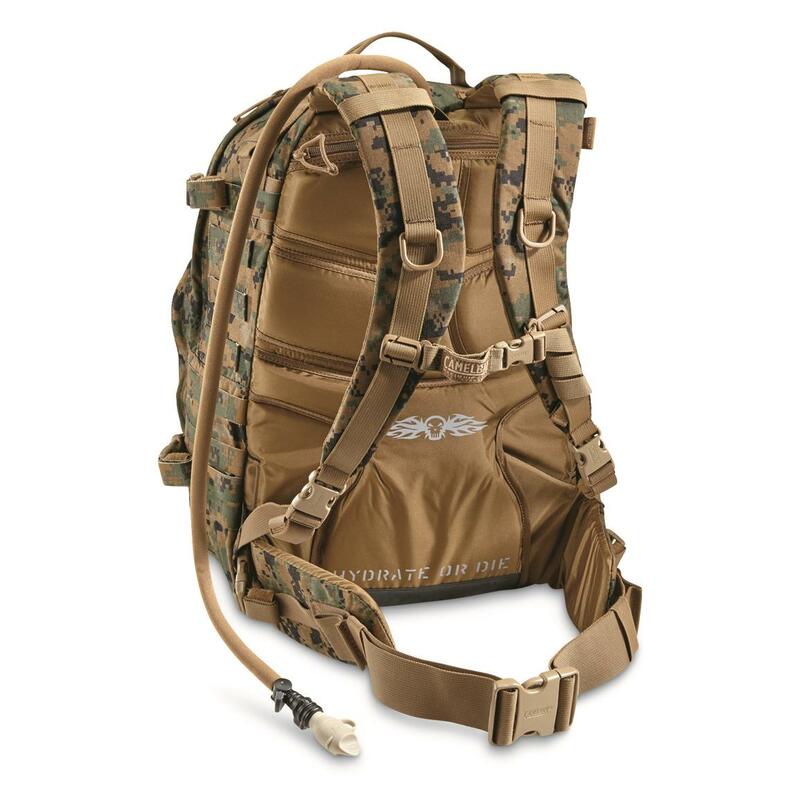 Size: 20 x 14 x 13.5"
U.S. Military Surplus Camelbak Assault Pack, New is rated 5.0 out of 5 by 5. Rated 5 out of 5 by Les11 from Great Pack This is as good of a pack as you are going to find and it comes with a water bladder. It is a good sized and well designed and well made.It is expensive but so is anything really good. Rated 5 out of 5 by Festus33 from Perfect for my needs I bought this to use as a shooting pack for long-range and it's perfect. Plenty of room inside for IFAK, poncho, jacket, tool kit, dope cards, range-finder, ammo, flashlight, and everything else I needed. Just enough inside pockets for organization without being too cluttered. This pack is tough and durable. Lots of molle webbing for attaching my shooting mat, etc. Camel system seems strong with plenty of volume. The price of $117 is much lower than anywhere else I could find. Highly recommend! Rated 5 out of 5 by Harry from Very nice pack. I've purchased prior to the Camelbak the Marpat one day assault packs and found them to be excellent. I recently picked up the Camelbak and WOW what a difference. 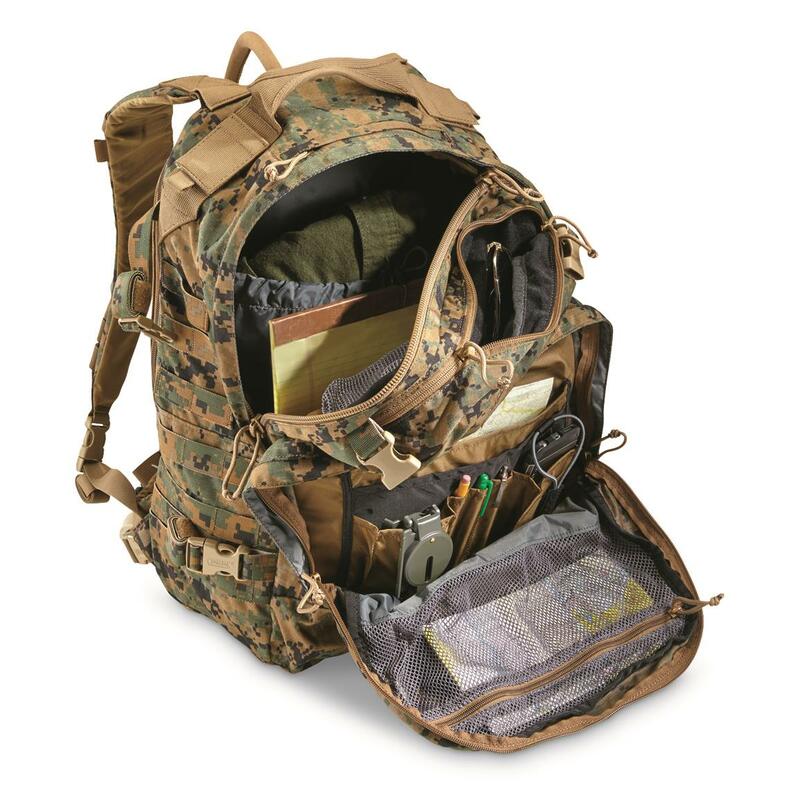 These packs are great, rugged and have more room than the Marpat assault pack that piggyback with the ILBE main battle pack. I will try to see if this pack will attach to the ILBE main pack via the straps and snap buckles. This pack is well worth the asking price. Like the Marpat, get yourself one of the camelbaks before they disappear. Rated 5 out of 5 by Dano from Grat price for an excellent pack Brand new, made in the USA Camelbak quality. Will probably buy a second. Rated 5 out of 5 by Justin from Very Nice Great deal on a very nice pack. 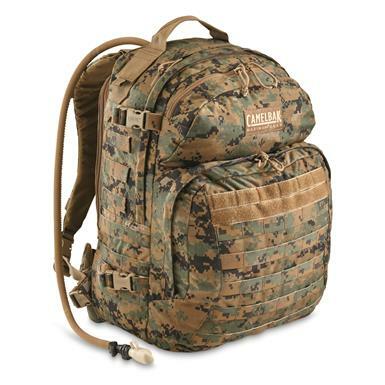 As a former Marine, I can tell this pack is excellent quality. Made in the USA and water bladder included, it doesn't get much better than this. Much much better than 5.11.